Home>Browse>Books>Children's>Why Can't I Be a Dinosaur? "Today. Is. Dinosaur. Day!" I roared. "Today is Aunt Daisy's wedding," said Mum. "And Nellie, you're the flower girl, remember?" "But I can't be a flower girl today," I said. "I'm a dinosaur." Mum, Dad and baby Riley are all busy getting ready for Aunt Daisy's wedding and no one has time to listen to Nellie. But Nellie can't wear her flower girl dress today. Today, she's a dinosaur. 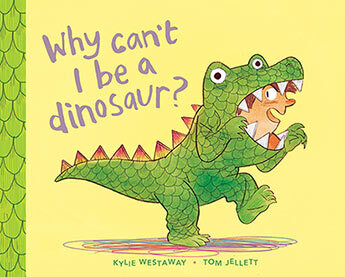 Why Can't I be a Dinosaur? is a warm family story about determination and ingenuity - and a wedding with a difference. Kylie Westaway has spent most of her life travelling and living in different countries. Her background is in theatre, where she worked on the Australian production of The Lion King and for the Bell Shakespeare Company. Kylie spent a year teaching 2-6 year olds in South Korea and started working in publishing when she returned to Australia. Her first picture book,Whale in the Bath, was published in the US, Germany and South Korea, and was a 2015 CBCA Notable Book. Tom Jellett has illustrated a number of books for children including Australia at The Beach by Max Fatchen, The Littlest Pirate series by Sherryl Clark, The Gobbledygook is Eating A Book by Justine Clarke and Arthur Baysting, My Dad Thinks He's Funny by Katrina Germein and the follow up My Dad Still Thinks He's Funny. Tom has also been an editorial illustrator for News Limited and been included in the Editorial and Book category for Illustrators 53, exhibited at the Society of Illustrators, New York in 2011 and 2013. He was also included in Communication Arts Illustration Annual 2012, 3x3 Children's Show No. 9, and was Highly Commended in the 2013 Illustrators Australia Awards.